Saturday October 17th 1891 We got our baking done by noon and had a nice dinner ready. Fanny brought her Aunt Fanny over to spend the day. The girls came after dinner and Fanny took me over town to get some things. I did some little work in the evening. weather pleasant. Sunday October 18th 1891 The boys moved the stove out of the parlor in the morning and I worked till noon getting things fixed up and the dinner ready. The folks came over in the afternoon. Agnes did not come back to help with the supper. Mr Brown called in the evening. Monday October 19th 1891 It was a nice day and we washed and ironed both. I mended the clothes and put them away before supper. Will and I went over town in the evening. Tuesday October 20th 1891 Fanny came and took Mother to town to spend the day. I was busy with the work all forenoon. Will went to the Dennis sale and went after Mother when he came back. I was sewing all the afternoon and evening. Wednesday October 21st 1891 I was busy about the work all the forenoon and we were getting the lye ready to make soap. We worked at that all afternoon and got it done in very good order. I baked cake and dressed chicken for dinner tomorrow. Will and I went out to Marys and then on over town for awhile. Lee came home today. [the following text is written vertically in the right margin of the above entry] I had a letter from Charlie. 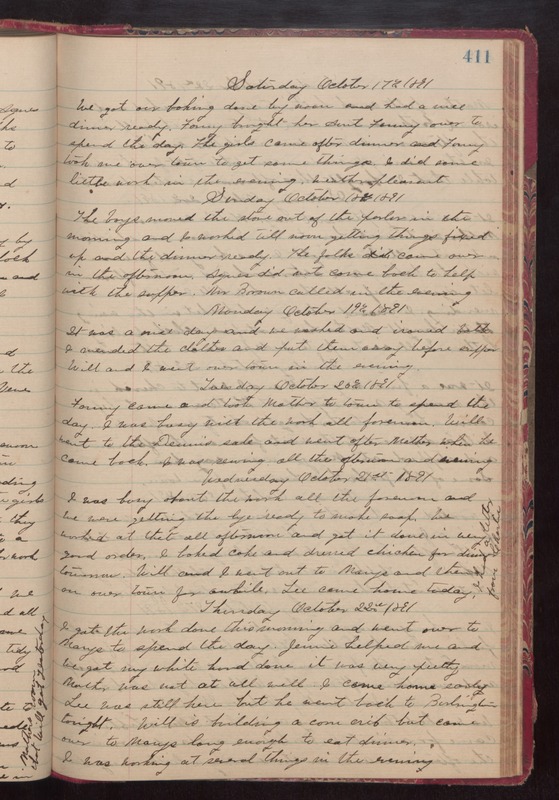 Thursday October 22nd 1891 I got the work done this morning and went over to Marys to spend the day. Jennie helped me and we got my white hood done. It was very pretty. Mother was not at all well. I came home early. Lee was still here but he went back to Burlington tonight. Will is building a corn crib but came over to Marys long enough to eat dinner. I was working at several things in the evening.